Greater engagement between India and the Customs Union of Russia, Belarus and Kazakhstan is seen as a useful counterweight to the growing influence of China, which is strengthening its economic ties with most Central Asian countries. Belarus, Kazakhstan, and Russia are mulling their next step towards greater economic integration. The Customs Union, of which all three countries are the founding members, will be replaced with the Eurasian Economic Union (EEU) by 2015, and current plans are to invite Turkey, India, and even Syria to join the new association. The planned format change was first announced at the Customs Union summit in Minsk in late October. It was also there that the three leaders of the future EEU voiced their intention to invite Turkey, India, and Syria to join, in addition to Armenia, Kyrgyzstan, and Tajikistan, whom the Customs Union is currently courting for membership. All the national-level approval procedures required for the signing of the EEU agreement should be completed by late spring 2014. "Any [regional] integration process involves several phases, from a preferential trade area and a customs union on to a single economic space and a currency union," says Valery Abramov, professor at the Russian Presidential Academy of National Economy and Public Administration (RANEPA). "We see that Russia, Kazakhstan, and Belarus are now using the model which was used in laying the foundation of the European Union." According to Abramov, the Customs Union is beginning to have a synergistic integration effect on the economies of its member nations, and is attracting new potential members: "Russia, Belarus, and Kazakhstan are transiting from the preferential trade area to an institutionally formalized Customs Union. The next step will bring even greater integration, not only in the form of a [single] customs area but also in the fields of scientific-technical cooperation [and a single] fiscal and economic policy." It should be noted, however, that the synergistic effect of the Customs Union has not been particularly great so far. Combined GDP within the union grew by just 1.7 percent in January through June 2013, and mutual trade other than in energy resources increased by a meagre 2 percent in the first eight months of the year. The figures could have been higher but for the serious problems experienced by the global economy, first of all in Europe. On the other hand, the Customs Union member nations have enough of their own problems. For example, Kazakhstan's President Nursultan Nazarbayev has recently complained that his country is seeing more negatives than positives from its membership in the Customs Union: exports have shrunk while imports have grown. It is of course possible that this statement is a part of Nazarbayev's strategy to prepare the ground for future negotiations. Russian media have been reporting that Kazakhstan has turned into the primary beneficiary of Moscow's new anti-alcohol campaign over the past two years: a sharp increase in Russian alcohol excises has resulted in a considerable disparity between the liquor prices in the two countries. Kazakhstan availed of the situation by boosting domestic production and exporting to Russia, where its brands compete in price not only with high-end products but also with semi-legal cheaper spirits. 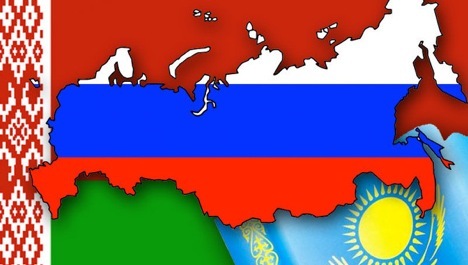 Russia's trade with the other Customs Union countries decreased by 4.5 percent in January through August 2013, the Federal State Statistics Service reports. This is the result of a dramatic decrease in trade with Belarus in the aftermath of the so-called fertilizer war between the countries. In the meantime, trade with Kazakhstan grew by nearly 16 percent over the same period. Says Christopher Hartwell, senior research fellow at the Institute for Emerging Markets Studies: "We have seen trade between Russia and Kazakhstan increase, due to the greater ease of doing business now, but in terms of its actual effect on the economies, it probably is very little – Kazakhstan, Russia, and Belarus were going to trade with each other anyway, although more so Russia-Belarus and Russia-Kazakhstan. Thus far, there has been no real increase in trade between Belarus and Kazakhstan, but that has more to do with their own economies and not the Customs Union." There also remain unresolved issues related to the transportation of oil, railroad tariffs, and power supplies. Alexander Razuvayev, chief analyst at forest broker Alpari, is convinced that so far the Customs Union is only benefiting Belarus. Apart from the fact that the stability of the Belarusian rouble is de-facto based on direct financial aid provided by Russia and Kazakhstan, Minsk is set to become the main beneficiary of an expected worsening in the relations between Moscow and Kiev. Once Kiev has signed the Association Agreement with the EU, Ukrainian commodities are expected to disappear from the Russian market and get replaced with Belarusian products. "[Such a development] will support Belarus' economic growth, improve [that country's] trade balance, and strengthen the Belarusian national currency," Razuvayev says. The greatest sensation of the Minsk summit became Nazarbayev's proposal to consider the possibility of inviting Turkey and Syria to join the future EEU. It is true, however, that the statement was made during Nazarbayev's emotional rejoinder to critics of the Customs Union as a "reincarnation" of the Soviet Union. Later on, Russian President Vladimir Putin said that the Indian prime minister had asked him to consider the idea of signing a free trade agreement between his country and the Customs Union. Russian experts are sceptical of the prospects of the EEU taking on India, Turkey, and Syria. Says BCS Premier expert Sergey Deyneka: "These countries will not join in the foreseeable future. There is nothing more to it than proposals at this point, there are a lot of [arguments against such a move], and there are countries that would be much more interested in joining, whose candidacies will most likely be given top priority." Razuvayev concurs: "The main idea of the Customs Union is to integrate former Soviet territories. Neither India, nor Turkey, nor Syria has ever been part of either the Russian Empire or the USSR." In the case of Turkey, there is an additional problem: Armenia is eager to join the Customs Union, and the 1915 genocide of Armenians is an issue of principle to both countries. Besides, Turkey has a free trade agreement with the EU, meaning it is integrated with Europe to an even greater extent than Ukraine. Experts are somewhat less critical with regard to India's EEU prospects: that country's potential accession to the union is seen as a useful counterweight to the growing influence of China, which is strengthening its economic ties with most Central Asian countries. Says Vincenzo Trani, chairman at Concern General Invest: "Unlike, say, Italy, which mainly exports exclusive products, India and China are seeking new markets for their commodities now that the U.S. consumer demand has declined. Russia is their first choice after the US. India joining the EEU would help that country beat China to a leading position on [the Russian] market." RANEPA's Abramov says Russia and India have a successful history of arms trade and enjoy solid long-term economic ties: "Therefore, [India's possible membership] will have to be considered in terms of its restrictive potential, first of all in terms of giving India preferential treatment. This is not something prohibited by international relations, including [by] the WTO."